A lot of people never have the opportunity to use their cameras in freezing temperatures. Needless to say, that is not a problem here in Minnesota. Even though as of late winters have been relatively mild, there are no guarantees that this might not change. I have been out shooting in temperatures as low as -30F. This brings up the ever reoccurring question if we need to treat our cameras differently in cold weather? The short answer is ‘not really’. These days, when our cameras rely more than ever on sufficient battery power, we should, however, be aware that they don’t like low temperatures very much at all. Subsequently, one or two fully charged extra batteries are definitely a good idea. Carried in an inside pocket, to keep them warm, should prevent any mishaps of camera failure due to lack of battery power. In addition, it is advisable to carry the cameras underneath our clothing as well to keep them from getting any colder than necessary. It is also very much advisable not to breathe on your camera, especially the glass of your lenses and the viewfinder. They will instantly be covered by a frozen layer of moisture which will not evaporate. On the lens it will function as a dense diffusion filter and the viewfinder will be rendered almost useless. Finally, carry along a ziplock bag, big enough for the camera and lenses. After a while of shooting, when getting ready to back inside, put the camera, lenses and other equipment into the plastic bag and seal it. This prevents the warm, moist inside air to get into contact with the equipment. Otherwise the result will be that the moisture condensates on the cold camera equipment. Excessive moisture and cameras simply don’t mix. Keeping the camera equipment in a closed case will also work as long as it is not opened. Such was the case a few years ago. It was a bright, sunny day; picture perfect for some nice winter shots, except the temperature had dropped to -30F with little chance of any noticeable warm up. While a lot of people would stay inside, this really isn’t all that bad, as long as you dress properly. I had just acquired a new Leica M5. For years I had heard of the impressive resistance of Leicas to cold temperatures and decided to give the camera a good test. Since the weather forecast was predicting temperatures as low as -30F, I decided to test the M5. To give the camera a head start, I put it in a freezer overnight. (Don’t forget that the temperature in an average freezer is almost balmy compared to -30F) The next morning the thermometer did indeed read -30 degrees. I set out to take photographs. I purposely carried the camera on a strap, outside my clothing, to make sure it would get as cold as possible. I walked to Minnehaha Park part of which runs along Minnehaha Creek as it winds its way toward the Mississippi in a relatively deep ravine. 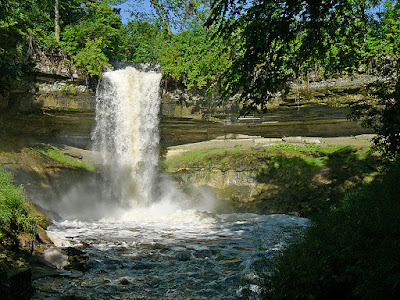 This was carved out over the years by Minnehaha Falls. 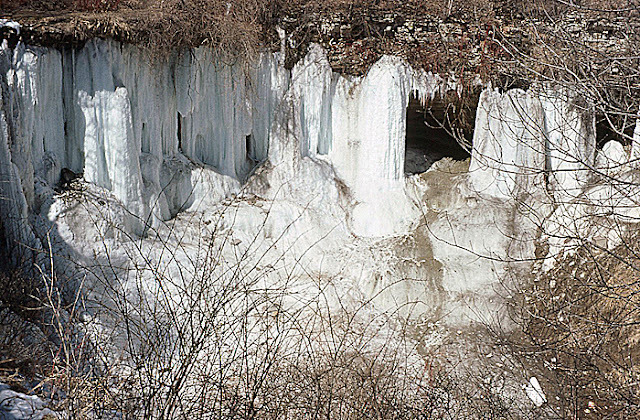 At such low temperatures the falls is totally covered in ice, definitely a different appearance from its summer looks. At the foot of the falls I noticed some openings in the ice which gave me the crazy idea to climb up to take a look behind the falls. Unfortunately the opening was in top of a very steep ice field. I don’t recall how many times I almost made it to the top, only to slide down to the bottom again. But I finally succeeded. A different world awaited me. 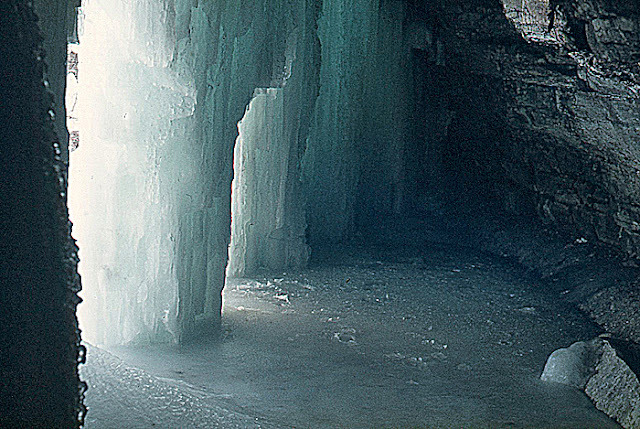 Almost everything was covered by the frozen waters of Minnehaha Falls, like being in an ice cave. Only one side was free of ice. I could hear the water falling to the bottom inside the ice which surrounded everything, creating a rather eerie atmosphere. I began to take pictures, but was restricted by the ice which only allowed moving behind the main waterfall. The rest was too treacherous to walk on. Of the series of shots that I did take, two stood out as particularly good. The camera worked flawlessly. The only indication that it was extremely cold was the focusing of the 50mm Summicron which was noticeably stiffer than under normal circumstances. I had been shooting for a while when I decided to go home. Once I returned, against my own advice, I went right inside, forgetting about the plastic bags. To my horror, the camera instantly froze over with about 1/8 inch of solid ice. The camera was so cold that the condensation froze immediately. As it warmed up and the ice thawed, I immediately wiped it off. The camera showed no ill side effects and served me well for many years after that, but I never ventured up that ice field again. Common sense dictated that it was too dangerous. That was obviously some extremely rough treatment and I certainly don’t recommend subjecting any of your cameras to such torture. 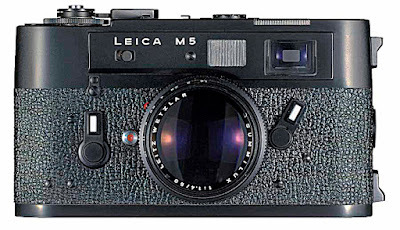 But it showed that Leica’s claims in regard to cold weather operation are not exaggerated. I have long since switched to digital Leica equipment and I have refrained from repeating that test with any of my current cameras, but I have used them at temperatures as low as about -15F with no ill side effects. I would not hesitate to use any of my cameras at temperatures a lot lower than that. But I don’t have anything to prove anymore, not with my cameras and certainly not for myself. Unless absolutely necessary, I will wait for more pleasant days for my outdoor shooting. Amazing. How did you get behind the waterfall? I climbed up the ice below the large opening at the upper right. It took several tries, but I made it. 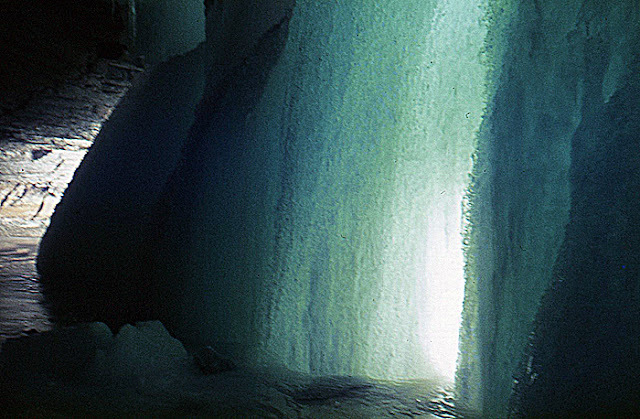 The photographs were taken behind the ice where the two small openings are at the top left. Must be super cool to be behind the ice. And i mean cool in two ways here. Doesn't film get brittle in cold temperatures? Film definitely gets stiffer at low temperatures, but I have never experienced any problems at all from film getting brittle. Minnesota in Winter is a good testing ground for that. The film I used was Agfachrome 64. I can't believe you subjected that camera to such torture. Weren't you afraid it might get hurt? For that matter, weren't you afraid to get hurt yourself? 30 below sounds absurd. I didn't consider it torture at all. 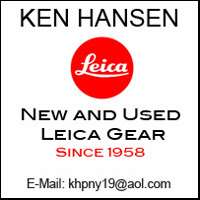 Leica has always stated that their cameras can withstand rather high temperature extremes. 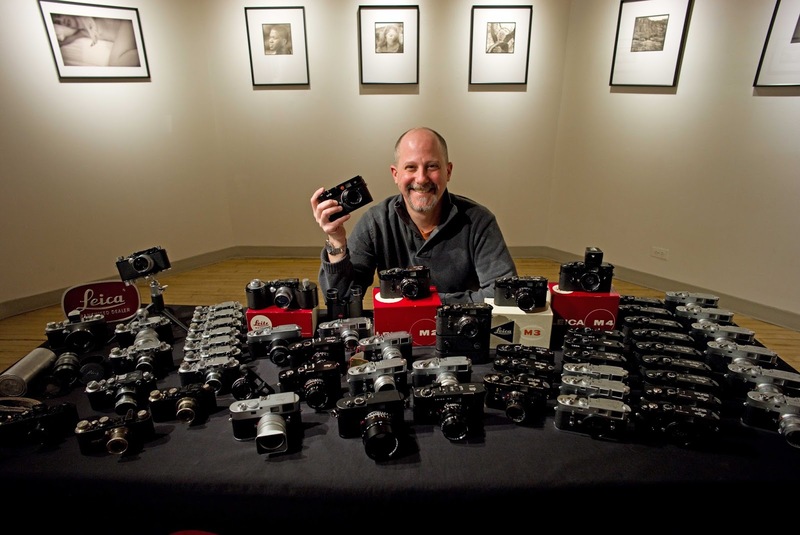 After all, Leicas have been used on polar expeditions as well as expeditions to the highest peaks in the Himalayas and elsewhere on earth, where they have been subjected to even colder conditions. I simply wanted to see if my camera was capable to do so. It passed with flying colors. As for myself, I had no problems at all. To withstand such low temperatures is simply a matter of dressing accordingly. As a matter of fact, this wasn't the only time I was out under such conditions and on several occasions I actually opened my jacket slightly because I was getting too hot. It is an interesting thought though, that a freezer or meat locker would appear relatively warm in comparison to 30 below. But I want to assure everyone that Minnesota is far from being the frozen tundra it is considered to be by many. During Summer it can easily reach 100 degrees or more. My cameras have performed equally well under those conditions also. Great advice. When Detroit gets below zero, I forget the digitals, and grab the M4. Your advice, especially to take a ziplock, is all very apropos. Did you test any other cameras under those conditions? Yes, I did. At the same time I had the Leica M5, I also owned a Zeiss Contarex, the so called Cyclops model. Unfortunately I sold it when Zeiss discontinued making the Contarex. A follow up model of the Cyclops, the Contarex Electronic, was the first camera to ever be used in space when the US conducted the first space walk with Ed White. 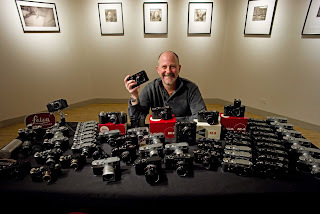 I still consider the Contarex one of the all time greatest 35mm SLR cameras and, together with the Alpa, it was the only other commercially available camera made with the same tolerances as the Leica cameras. My Contarex performed just as well as the M5 did, except it operated a lot slower. The shutter worked flawlessly, it was the mirror drive that got rather slow. Unlike most SLR cameras, which simply allow the mirror to flip up under spring tension, the Contarex used a gear drive. This was done to prevent any vibrations from the mirror going up. The mirror was literally moved to its upper position by a gear which, after the exposure reversed and moved the mirror downwards. The cold temperatures stiffened the lubrication of these gears to the extend that it took about three or four seconds for the mirror to reach its upper position. After that the shutter would be released and then the mirror slowly would move back down into the viewing position. How was that Zeiss camera used during the space walk? Was it mounted to the space suit like the Hasselblad cameras later on? For the space walk Ed white had been given an experimental manouvering device. It consisted of a tank with a propellant, about the size of a small fire extinguisher. At one end was a handle, to hold it with one hand and a crossbar with a nozzle at each end. The device was supposed to allow movement in various directions simply by triggering the exhaust nozzles. The Contarex was mounted on top of the device in the center. As it turned out, the camera worked flawlessly, the maneuvering unit proved to be a failure. Did Leica use any dampening device on their SLR cameras at that time? Yes, instead of a gear train like the Contarex, the original Leicaflex, The Leicaflex SL and SL-2 used a cam drive. It initially accelerated the mirror quite rapidly but then brought to a soft halt without any vibration at all. Based on my own experiences with Leica cameras here in Minnesota, that does not surprise me at all. Good to know. I still own an M5, it is my favorite camera. I had my M5 for several years. I used it mostly with the 50mm f/1 Noctilux. The extra bit of size of the camera never bothered me at all. Of course you want to protect your camera from getting wet, but I never hesitate using my Leica equipment in the rain. A bit of moisture has never created any problems for me at all. I usually keep the camera underneath some piece of clothing and only expose it to the elements when actually shooting. In really heavy rain, it helps a lot to keep the camera in a plastic bag with only the front of the lens sticking out. Make sure to use a lens hood. It will protect the front element of the lens to quite a degree. In cases like that I tear or cut an opening in the back for the viewfinder. The bag has to be big enough though to allow for enough flexibility to focus the lens. Hyperfocal settings are very helpful in this case.